Hand tufting began along the coast of New England and up into New foundland first as rug hooking, a utilitarian craft that was taken up by poor working class families using scraps of cloth to make rugs for their homes. Today hand tufters use the craft to make elaborately designed wool rugs and art pieces. In this 2-day workshop at The Hyde Park Art Center in Chicago, we will explore composition through this technique and make a tufted art piece with an analog hand tufting tool. We will skim the surface of the history of tufting craft and how it is used both for utility and art, using this as an inspirational springboard. We will look at how artists use tufting for rug-making, object-making, and art, and explore yarn as a textural drawing tool. Composition, design ratio and materiality are the foundation of rug weaving. Drawing from the patterns and colors in the natural world surrounding Haystack, we will explore the design process with an analog approach; beginning with colored pencil and graph paper and translating ideas to the loom. Weft faced weaving techniques and fibers will be explored first in a rug sampler and then with a final project. Students will go home with a rug sampler weaving, a small hand woven rug and pages of designs for future projects. Taught by Dee Clements and Margot Becker in partnership with Buckwheat Bridge Angoras fiber farm and Drop, Forge + Tool in Hudson, NY. This two day workshop explores the process of textile creation from the very beginning. Weavers Dee Clements and Margot Becker are partnering with the fiber farm Buckwheat Bridge Angoras to offer this Fiber to Textile weekend retreat. 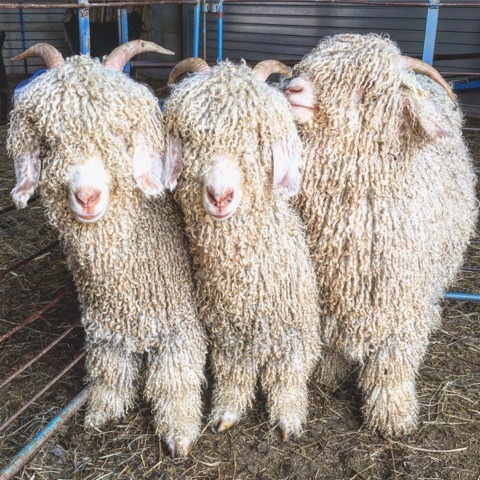 Spend one full day on the farm meeting the animals, seeing a sheep shearing demo, and processing your own fiber in the solar and wind powered fiber mill. We'll then teach you how to use your new drop spindle to hand spin the roving you just made into yarn. Day two is a full studio day in the town of Hudson, NY at Drop Forge and Tool learning how to weave your homespun yarn into a beautiful textile on portable lap looms. All materials and tools are included in the price and yours to take home at the end of the weekend! Transportation from Hudson to the farm plus a locally sourced picnic lunch on the farm will be provided! Meet in Hudson at 9:30am and we'll head out to Elizaville for a day at Buckwheat Bridge Angoras. We'll explore the farm, shear the sheep and spend some time in a real working fiber mill. After a break for lunch we'll spend the afternoon learning to drop spin our own yarn while enjoying their beautiful view of the Catskills. We'll head back to Hudson at 4 pm where you can explore the historic town and enjoy its many bars and restaurants. Studio Day at Drop Forge and Tool right on Warren St. in Hudson , NY. Join us at 10 am for a full studio day of weaving! We'll teach you how to set up your new lap loom, plus weft faced weaving techniques that can be applied to tapestry and/or rug weaving. Use your new hand spun yarn plus various provided wools to explore design, color and different yarn qualities. Step out mid day for lunch in one of Warren Street's lovely eateries. Class will conclude at 4pm. *Accommodation is not included. Contact us for recommendations on where to stay in Hudson, NY. Farm transportation on day 1 to the farm will leave from Hudson, NY. *There is direct Amtrak train service from NYC to Hudson, NY. *There will be light physical activity on the farm however we are happy to accommodate special requests and needs. Please do not hesitate to get it in touch with any questions. 50% refunds are available until May 6th.